I love regular taxidermy and all sorts of faux taxidermy, and this version of how to make a deer head with a sock from Boycraft: Loads of Things to Make For and With Boy (and Girls) is just darling! Scroll down for the fun and easy tutorial on how to make a faux deer head wall decoration with your kids, and if you would like to get yourself in the running for a copy of Boycraft along with Origami 365 and some cool Horizon Group craft supplies pop on back to Monday's Craftside post. Click on these pages from Boycraft to enlarge and read the full fun and easy tutorial on how to make a wall mounted deer head from a recycled sock. Boys like making stuff. Actually, boys love making stuff. Not just model boats, paper airplanes, bows and arrows and catapults – although they love that too. Boys like knitting; scarves, hats, spiders and monsters. Boys like sewing – especially if they can use the sewing machine. They like cutting and sticking and gluing and sawing and hammering. However, sometimes people – both boys and their parents – need to be reassured that it’s okay for boys to make things. Boycraft does exactly that. 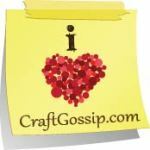 Boycraft is packed full of projects to make for and with boys. It will be illustrated with a mix of photographs and graphic-style illustrations. Sara Duchars and Sarah Marks founded Buttonbag in 2005, a young innovative company breathing new life into old crafts by updating them in a fresh, contemporary way. They have graduated from a stall at London's Greenwich market to a network of more than 20. Happy St. Patrick's Day, My Craftside Peeps! Plus, a whole bunch of Horizon Group craft supplies including pompoms, paint, colored floss, glitter, pipe cleaners, rhinestones, beads and more! Enter win all these goodies by March 26. Come on back to Craftside this week for a twisted rose origami tutorial from Origami 365 and a faux taxidermy deer head with a sock from Boycraft.